Description: AD File Transmitter is an application, allows you to automate frequent file transfer operations between different offices or different computers and process data replication tasks. The files anf group of files can be sent thru the local area network (file copy tasks), sent by e-mail, recieveing from e-mail or download from FTP servers. Description: ADDAX is a file sharing application operating on the Gnutella Network. It allows you to share any file such as .mp3s, .avis, .jpgs, .tiffs, etc. ADDAX is written in Java, and will run on any Windows computer. Distribute your unique content to the planet without having a website! At ADDAX, we are working to build up the future of open peer networks and the digital playground. Description: Anubis P2P (peer-to-peer) is a new file sharing program that includes all the recent p2p optimizations, helping users to search and download over some several networks around the internet. All in one features like file manager, download statistics, chat and IP filters make this p2p a complete tool for all kind of users. Description: AresGalaxy Acceleration Tool is a new add-on for AresGalaxy file sharing program. Latest technology implemented will enable you to download MP3s, movies and other desired files faster than ever. The program will ensure that your bandwidth is used to its highest capability. Also the booster will help you find more sources to download. It is free and do not include ads, adware, spyware, Trojans or any other malware - 100% clean. 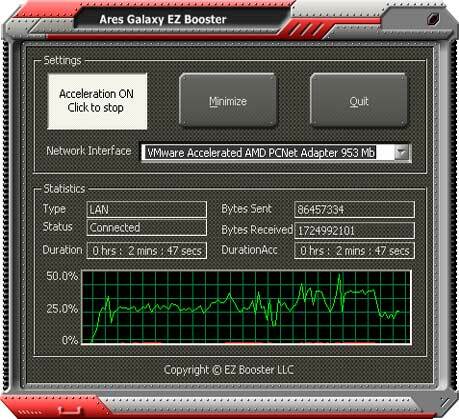 Description: Ares Galaxy EZ Booster is a highly effective add-on for Ares Galaxy P2P client created for an automatic increase of the download process; it is absolutely easy to install and use and once you have done that you will find the files you want with far more speed than before. Its interface will prove best visual and functional qualities. Ares Galaxy EZ Booster is FREE and does not include ads, adware, spyware, Trojans or any other malware! 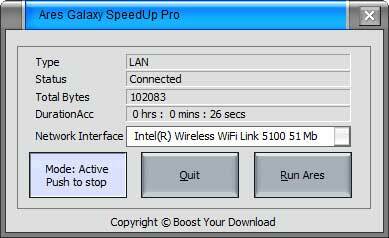 Description: Ares Galaxy SpeedUp PRO is a powerful acceleration plug-in for Ares file sharing program. State-of-the-art software technology used by Ares Galaxy SpeedUp PRO generates dramatically decreases of downloading time. The add-on consumes very low resources from your computer and the nice and easy interface offers a great experience. Description: Ares Galaxy Turbo Accelerator (AGTA) is a powerful acceleration plug-in for Ares file sharing program. State-of-the-art software technology used by AGTA generates dramatically decreases of downloading time. The add-on consumes very low resources from your computer and the nice and easy interface offers a great experience. AGTA is an essential accessory for any Ares user and is FREE. Description: Ares Galaxy Turbo Booster(AGTB) is a powerful acceleration plugin for Ares file sharing program. State of the art software technology used by AGTB generates dramatically decreases of downloading time. The addon consumes very low resources from your computer and the nice and easy interface offers a great experience. AGTB is an essential accessory for any Ares user and is FREE.